Bahia Principe Cayo Levantado Resort Review: Isla Cayo Levantado is a small, secluded island in Samana Bay off of the Samana Peninsula. Gran Bahia Principe has created a new Caribbean luxury resort, an all-inclusive getaway that blends and enhances the intimacy of this small, beautiful, relatively untouched island paradise. Lose yourself on the picture perfect white sand beach as you gaze across the turquoise waters, framed by majestic palms and warmed by the Caribbean sun. 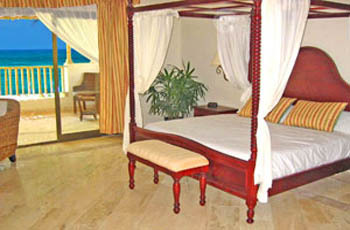 The resort offers its guests a feeling of exclusivity as they are the only resort on the island. 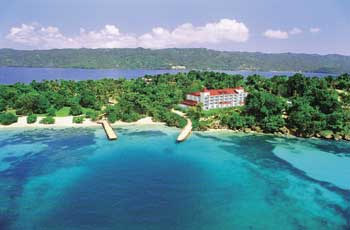 Gran Bahia Principe only offers 195 rooms to ensure the virgin quality of the island. Gran Bahia Principe Cayo Levantado caters to a clientele that wants and expects elegance while in paradise. Well appointed rooms with breathtaking views and gourmet dining are fixtures of the resort. A jogging track and tennis courts are available for that morning workout or afternoon challenge. Spa services act as a catalyst to your relaxation while the tropical surroundings convince you to leave your stress on the mainland. Two large free form pools will lure you from your rooms and entice you to lounge around, enjoy a drink or make a friend. The pools are joined by the open air Jacuzzis, hydro-massage pool and wooden hammocks. Soak up the sun or seek shade under one of the many palapas scattered around the pools. Bahia Principe Cayo Levantado Resort Review Accommodations: Experience the luxury of hardwood floors and marble bathrooms at Gran Bahia Principe Cayo Levantado. The resort offers 195 rooms divided into Junior and Superior Suites and Ocean side Villas. Gran Bahia Principe Cayo Levantado offers the best in style and comfort in their finely appointed, superbly equipped rooms. Four post beds and top quality furnishing, married with exquisite views help create the perfect mood for your holiday in paradise. Bahia Principe Cayo Levantado Resort Review Activities and Excursions: Feel the Caribbean wind in your hair as you gallop around the island on one of the resort’s horses. Don’t miss a step in your training program by taking advantage of the resort’s running track. Explore the true meaning of "love and deuce" while on the resort’s tennis courts. Linger on the warm sand, in among the tropical palms of the island’s beautiful beaches. Let the tranquility of Isla Cayo Levantado overcome you. Cayo Levantado offers the appeal of two worlds. One is the secluded, intimate climate of the island; the other is the appeal of Samana, the Ecotourism heart of the Dominican Republic. 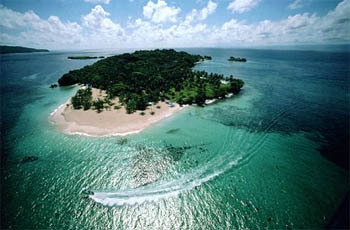 Travelers flock to Samana, attracted by the incredible interaction they can have with the majesty of the natural world. There are many excursions around Samana such as Whale watching tours. Get close to a humpback whale. This large, but gentle mammal plays in the warm waters of Samana Bay, protected by strict whale watching laws, the humpback whale is able to enjoy their natural habitat and put on a show for curious travelers without ever feeling threatened. Samana Bay is protected from the Ocean’s temperamental nature and so is the perfect playground for a variety of marine life making Samana a desired destination for Scuba Divers and snorkeling enthusiasts. Bahia Principe Cayo Levantado Resort Review Restaurants and Bars: Bahia Principe elevates dining to a new level with the perfect marriage of elegance and taste. Gran Bahia Principe Cayo Levantado offers gourmet meals in four different restaurants. Restaurants include the Buffet, Italian specialty, Fish and Seafood specialty and a Gourmet restaurant with Sommelier. Guests are treated to unlimited a la carte meals, Lobster upon request, champagne and caviar breakfasts, moonlit, beachside dinners and a Sommelier to help you choose the perfect wine to accompany your meal. In addition to the exquisite meals and treatment of the Gran Bahia Principe Cayo Levantado, guests are also welcome in any one of the restaurants in the other three Bahia Principe resorts on the mainland. Reservations are required. Gran Bahia Principe Cayo Levantado has four different bars that serve International and Premium drinks. Bars include two snack bars, a lobby bar and a Disco-Karaoke-Pub. For your next romantic getaway choose elegance and luxury in the intimate setting that Gran Bahia Principe Cayo Levantado has to offer. Bahia Principe Cayo Levantado offers everything you are looking for in the perfect vacation for your family, a romantic getaway, a soothing retreat or maybe you are simply looking for paradise. 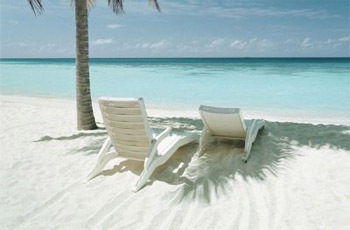 Anxious for your trip to Cayo Levantado? Hit any of the "Get Quote" buttons on the page and we'll send you a booking confirmation form or give us a call toll-free and we'll answer any questions you may have. Let's make that dream vacation a reality - join the All Inclusive Resorts Family. Do your own Bahia Principe Cayo Levantado Resort Review this season!